For as long as we can remember we have been fascinated by space, as well as the watches that have accompanied the astronauts on their pioneering missions. Tested to extremes, these space watches are pioneers in their own right; able to not only withstand, but excel in the most inhospitable environments known to man. What Makes a NASA Certified Space Watch? In 1964, NASA responded to requests from astronauts and began to test watches with the aim of finding a watch that would reliably survive space missions. Concerned that an automatic watch would not be able to wind itself or keep accurate time in a microgravity environment, NASA selected mechanical hand-wound pieces from brands such as Bulova, Longines and Omega to be put through the pre-space tests. These tests were designed to destroy the watches. Pushed to their absolute limit, the watches were exposed to instantaneous 200 degree shifts in temperature, subjected to high pressure, low pressure, and extreme shocks of up to 40gs. They were shaken and vibrated, heated and frozen, and placed in highly corrosive 100% oxygen humidity. In effect, they were subjected to the same inhospitable environment that an astronaut would have to endure in space. In the end it was only the Omega Speedmaster which survived this onslaught. Today it remains as one of only four watches officially certified by NASA, and is the only watch certified for use on spacewalks. What Are The Key Features of a Space Watch? Specified by NASA for use on the original Moonwatch, although it is more prone to scratching than sapphire crystal, it doesn’t shatter on impact making it much safer in zero-gravity environments. In addition to the stainless steel and NATO bracelets, this Moonwatch Professional is equipped with a fabric strap for astronauts. In the early days of space exploration, manual winding movements were preferred due to the unknown effects of microgravity environments on automatic movements. Like pilot’s watches, high-contrast dials increase the legibility of the watch, whilst bright superluminova coating ensures the watch can be read in all conditions. The chronograph function allows complex timing operations to be performed. Whilst Omega and their legendary Moonwatch takes Centre stage when it comes to space exploration, it’s not surprising that other watch brands have been part of many space missions; selected for their ruggedness and extreme precision. Creators of the first Swiss Made timepiece to orbit the Earth, more recently TAG Heuer have accompanied the SpaceX mission, the first commercial spacecraft to visit the ISS. 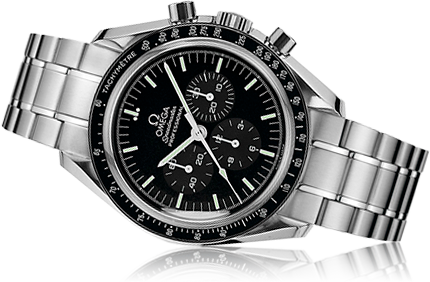 Making their first voyage into space in 1967 on the wrist of astronaut Wally Schirra, Omega was not only the first watch on the Moon, but has been part of all six lunar missions. Makers of the first Swiss wristwatch in space, Breitling’s contribution to the Aurora 7 mission proved that their Navitimer model is not only a master the skies, but of space too. 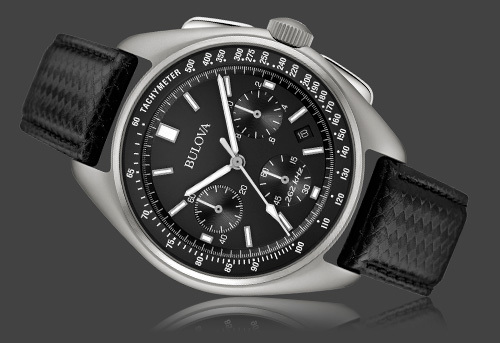 Impressed by the precision of their Accutron technology, Bulova was instrumental in launching Explorer, America’s first satellite, and were part of 46 NASA space missions. During the first moonwalk, a Bulova timer was even placed in the Sea of Tranquility. Whilst the astronauts themselves have made huge leaps for mankind, the space programme has also witnessed many horological firsts. On 12th April 1961, Russian cosmonaut Yuri Gagarin became the first human in space. The first American to orbit our planet, on his wrist was a modified Heuer stopwatch - the first Swiss Made timepiece to orbit the Earth. On board NASA’s first manned mission focussed on science, Scott Carpenter’s Breitling Navitimer became the first Swiss wristwatch in space. 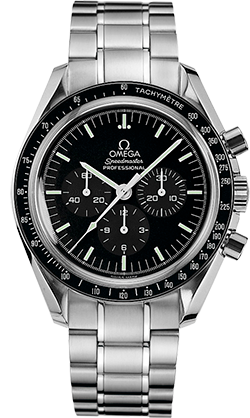 Following Omega’s first trip into space in March 1965, the Omega Speedmaster made history on the wrist of Ed White when he became the first American to spacewalk on his Gemini 4 mission later that year. 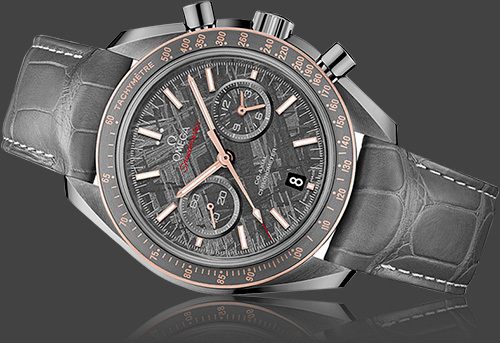 The Speedmaster remains the only watch to be officially certified for use in open space. On board Apollo 8 in December 1968, this three-man crew became the first people to leave Earth’s orbit, before orbiting the Moon and returning safely to Earth. Paving the way for the Apollo 11 mission less than a year later, the crew were also the first humans to see the Earth as a whole planet, to orbit the Moon, to witness an Earthrise and to see the dark side of the Moon. On the 16th July, 1969, the world was glued to their screens as the astronauts of Apollo 11 prepared to land on the moon. Whilst Neil Armstrong made history by becoming the first human to walk on the moon, the Omega Speedmaster became the first watch on the moon on the wrist of Buzz Aldrin - Armstrong had left his Speedmaster in the lunar module. It was this historic mission that earned the Omega Speedmaster the nickname ‘The Moonwatch’, perhaps making it the most recognisable of all the watches linked with space. Two days after launch on April 13th 1970, the crew of Apollo 13 had their hopes of landing on the moon crushed when one of their spacecraft’s oxygen tanks burst. Using lunar gravity to propel the crippled spacecraft back to Earth and without any of their normal navigational equipment, they timed a 14 second engine burn with their Omega watch, correcting their course and enabling them to get home safely. Apollo 13 made history as a successful failure and, for Omega’s contribution to the safe return of the crew, they were awarded the Silver Snoopy Award, a special honour awarded by NASA for outstanding contribution to the success of the mission. Part of the fourth manned lunar landing on board Apollo 15 in 1971, Dave Scott and his fellow astronaut James Irwin remained on the Moon for 66 hours and 54 minutes, setting a new record for lunar stay time. Due to damage to his official watch, Dave Scott wore his own Bulova watch on his second spacewalk, making it the first privately owned watch to walk on the moon. The last man to leave footprints on the Moon, Eugene Cernan was the Commander of the Apollo 17 mission in 1972; the sixth and final Moon landing. As well as being the last of the Apollo space missions, it set new records with the longest moon landing, longest moonwalk, largest lunar sample and the longest time in lunar orbit. The first British European Space Agency (ESA) Astronaut, Tim Peake left Earth for the ISS on 15th December 2015. Spending over 185 days in space, he took part in the first spacewalk outside the ISS by a British astronaut on 15th January 2016. During his mission, Peake wore the Omega Speedmaster Skywalker X-33. This was the first space watch designed in collaboration with astronauts, and is the watch which all ESA astronauts are issued with. Officially launched at NASA’s space centre in Houston in March 1998, the Omega Speedmaster Skywalker X-33 was designed especially for space explorers. Answering the astronaut’s request for even greater accuracy and complex functionality, the Skywalker X-33 was the first space watch to be developed in collaboration with astronauts, and features both digital and analogue displays. This new edition of the X-33 is powered by a revolutionary new movement which was developed under an ESA patent and is based on an invention by the astronaut Jean-Francois Clervoy.